In a recent lawsuit in Florida, a Fort Lauderdale man has filed a personal injury lawsuit for a slip and fall against the retail giant Walmart. The lawsuit is notable because the man specifically names the manager on duty, whose name has not been released. Walmart has, in turn, filed a motion to have the manager removed as a defendant, but that motion has been denied. This may sound irrelevant, but actually, it has a profound impact on the case. Diversity jurisdiction gives a federal court the power to hear a case when the amount of money in question exceeds $75,000 and the plaintiffs in question reside in different states. The plaintiff in question resides in Fort Lauderdale where the Walmart is located. By naming an on-duty manager as a co-defendant in this case, the plaintiff has effectively prevented the lawsuit from being heard in federal as opposed to state court. Walmart attempted to argue that because of the amount of damages the plaintiff was seeking and because of the diversity of citizenships, that the case should be removed to a federal court. In some instances, it could be of benefit for the defense or the plaintiffs to have their cases heard by one or the other court. In this case, Walmart liked its chances with the federal courts while the plaintiffs clearly favored their chances with Florida’s state courts. What ensued was the addition of the store’s manager to the lawsuit in an attempt to block the case from being removed to a federal court. Walmart was vehement in its arguments that the addition of the manager to the case served no other person than to eliminate the possibility of diversity jurisdiction. They further claimed that managers cannot be held liable in corporate tort claims, so there was no sense in an adding a floor manager to the case other than to block diversity jurisdiction. While there’s no indication that they were wrong, the court still denied their Walmart’s motion. It will be tried in a Florida court. In order to prove a slip and fall case against a proprietor, you must show that they were negligent. 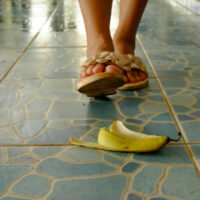 Generally speaking, negligence can be assumed when a spill or a banana peel is left in a high traffic area. However, there are plenty of instances in which a proprietor may not be liable, even when a patron is injured by fall in their store. The hardest element to prove in a slip and fall case is that the manager knew or should have known about the potential hazard. In the second instance, there may be areas which are prone to spills or even having banana peels thrust about the floor. Here, a personal injury lawyer will make the case that Walmart employees should have been aware of the problem and removed the hazard before it became an injury risk. The Miami attorneys at the office of Alan Goldfarb, P.A. have litigated several slip and fall accidents. If you have been injured due to carelessness and negligence of a proprietor, you deserve to be compensated. Give us a call at (305) 371-3111 or contact us online, and we can begin preparing your case immediately.